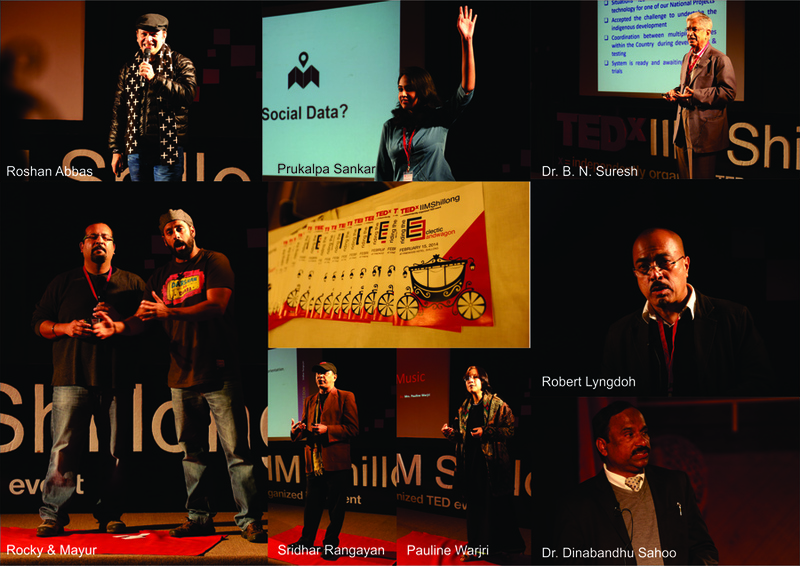 IIM Shillong hosted its second TEDx event on 15th February 2014. The event saw nine esteemed speakers sharing their ideas and experiences on the theme “Riding the Eclectic Bandwagon”. The event received enthusiastic participation from the students and faculty of IIM Shillong, students from other local institutions and officials from the Government of Meghalaya. The wheels for this event had been put into motion several months ago. A series of promotional activities, such as ‘Know Your Speakers’ contest and Eclecti‘click’ – a photography contest, had generated great enthusiasm among the students, which culminated in the event held on Saturday at Pinewood Hotel. Nine speakers, from a variety of fields like science, social service, food & travel, business, entertainment and music, shared their experiences on how they charted their own paths on grounds thought to be familiar. The first speaker Dr. B.N.Suresh, Director of Vikram Sarabhai Space Centre (VSSC), explained through his own experiences at the IIST, how to face challenges and create opportunities from them. The second speaker to take the stage was Mr. Sridhar Rangayan, a filmmaker and LGBT activist. In a powerful and thought-provoking talk, Mr. Rangayan shared with the rapt audience the social taboos and problems faced by people with different sexual orientation. He talked about laws and societal norms that impose perceptions and challenge the freedom of individuals. Prukalpa Sankar, founder of Social Cops, took the stage next and charmed the house with the tale of her journey, from being a concerned citizen to becoming a founder of a technology social enterprise. She urged the audience to challenge themselves in the ‘Game of Life’ and defy the conventional rulebook. The next speaker, Mr. Robert Lyngdoh picked up from where Prukalpa had left- daring to jump off the cliff. In a riveting talk, he analysed the reasons for the alienation faced by the people of the North-East from the rest of India, and the possible remedial measures for that. He pointed out that Eco-tourism and inclusive tourism were the way forward for the north-eastern states. There was a one and a half hour break for lunch, during which the attendees interacted with the speakers. Post-lunch, the hall at Pinewood Hotel burst into melody. All the attendees were literally on song, as Ms. Pauline Warjri, freelance musician and founder of the Aroha Choir, created magic with music as she talked about the power of music educators. Her talk ended with an amazing performance by the Aroha Choir to a song composed by her. Next up on stage was the duo of Rocky and Mayur, hosts of ‘Highway On My Plate’. They talked about Indian food and eating habits-‘from evolution to revolution’. The talk was eclecticism personified- for the palate! Dr. Dinabandhu Sahoo, inventor of the “Carbon Dioxide Capture Box”, was the next speaker, and talked about ‘farming the sea’, using the algae for a greener and better world and fostering a ‘Blue Revolution’ in the process. The last speaker of the day was Mr. Roshan Abbas. He talked about an often discussed term, although in a different way. Talking about the ‘Roadless’ travel instead of the road less travelled, Mr. Abbas emphasised on the need to ‘fail fast’ but ‘learn faster’ and to aim high all the time. He captivated the audience, urging them to look for newer goals to conquer every time, using instances from his own life. Thus ended the second edition of TEDxIIMShillong. The talks were powerful, evocative and in line with the theme of ‘Riding the Eclectic Bandwagon’. Speakers, from fields as different as food and music, gave talks that somehow seamlessly fused into one another. Notes found their way to taste, freedom of expression to concern and the need for action, as the audience soaked in the questions raised and the answers offered. The event ended on a resounding note of success, with a promise for the TEDxIIMShillong of the next year to do the same-bring people together to share their ideas worth spreading-albeit, on a larger scale.